What Animals Eat the Mongoose? The mongoose is a mammal that is native to Africa and southern Eurasia. There are over 30 species of this small carnivorous animal. Cats, ferrets and weasels are close relatives, and they feed on crabs, rodents and chickens. They are known for their lightning speed and are kept as pets in places like India where they help rid homes of dangerous snakes and rodents. 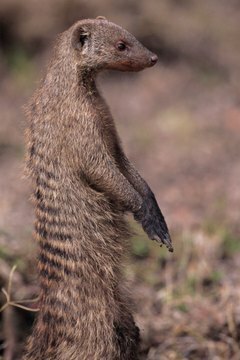 The mongoose live in a variety of habitats and has several predators. Snakes are the natural enemy of the mongoose--especially the cobra. A mongoose has speed and agility on its side when fighting a cobra, but it is not immune to the deadly venom. Cobras can grow up to 12 feet and eat small mammals like the mongoose. The Marabou Stork has a huge meat-cleaver bill and is one of the world's largest flying birds. The marabou is known for its unsightly appearance with skinny legs and hunched over posture. Mongoose work together to protect their babies and are scrappy fighters but the stork will grab an unattended pup. Jackals generally scavenge for food, but they are known to hunt and kill their own food. They are bigger than the larger species of mongoose and hunt in pairs to increase their chances of success. Jackals live in open plains where mongoose often build their colonies. Mongoose are eaten by hawks and other raptors that do their hunting from above. They can fly at great speeds and can spot prey with their keen vision. Bigger species of hawks can capture animals as big as raccoons with using their powerful talon and beaks.